This is a good one, right? 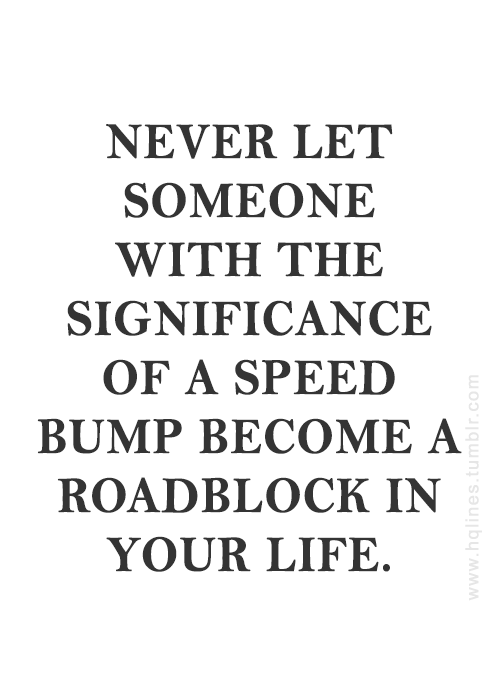 Have you met some speed bumps in your life? I know that I have. The lady in the outplacement company who told me that 3 out of 4 business fail, and that second language speakers have low chances of “surviving” (this advice came from an employee who has never run her own business). One of my well-meaning friends who told me that I was crazy to focus on manufacturing companies because these companies would all move offshore and that nobody else would waste their energy on this industry. I am not gonna lie, these were difficult moments to overcome but today they have become some pretty good stories to tell. After almost 12 years in business I am so proud that I have always managed to stay true to myself, my passion and my purpose. I encourage YOU to do the same. There are certainly people who want to protect you because they don’t want to see you “fail”. The challenge is that they come from their own experience, their own mindset, their own thought process and their own level of courage and determination. I actually want to thrive, not to survive. I guess I have to become so good that I will be that magical 4th business. You are such a huge company. If you issue cheques for “only” $5,000 and they bounce, maybe you should stop doing what you’re doing. Manufacturing is an important part of any economy. How awesome for me if nobody else wants to focus on this industry. Things can be difficult but if you find the positive in a challenging situation, you will get to where you want to be. I want to close with a story that you may have heard before but this story is such a great reminder of the differences in mindset. Make it a super weekend!